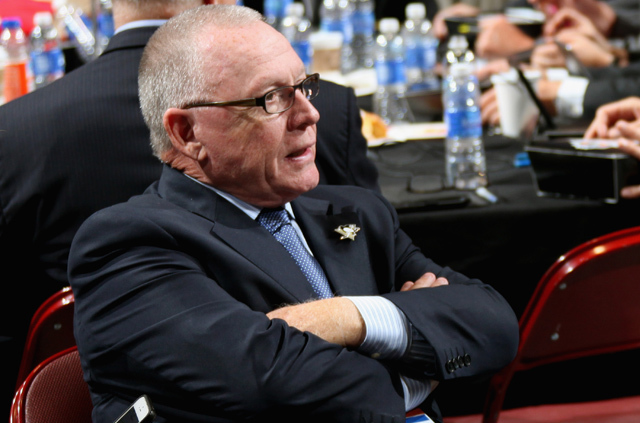 GM (grand-master) Jim Rutherford is playing it cool when asked about the Murray/Fleury situation and possible trade targets for the deadline coming up in about a month. Who can blame him either? We have the same squad (minus Glass Beau and Rev Lovejoy) as last year's championship squad and the team has looked good aside from the stray strange game. Rutherford, if anything, has been pretty open and honest with press about his intentions with the team. He avoided his typical December trade as himself, and all other NHL GM's, seem gunshy with the uncertainty of the Vegas expansion draft. It's fun and challenging to look ahead and try and see how next year will pan out. Rutherford has left the team in great shape for years to come with no albatross contracts in the books. He will have to make one of more challenging decisions of his Penguins career with the goaltending situation which everyone but himself seems worried about. So ... $13,000,000 possibly to play with this summer. You have Jake Guentzel (who should not go back the AHL), an untested Sprong, Sundqvist, and Dominik Simon who aren't guarantees but I feel they can competently fill a roster spot that gets opened by the Vegas draft. The first item of business is paying Justin Schultz who becomes an RFA this summer. With a career renaissance in Pittsburgh, Schultz has emerged as the defensemen the world thought (at least Gretzky and Coffey) he was. He's 4th in the NHL in scoring defenseman as of this writing and his time with the Penguins in contrast to his time in Sarlacc Pit Edmonton has been night and day. How much is Schultz worth? Well in comparison similar production Burns (8m), Karlsson (6.5), Hedman (7.8), Shattenkirk (4.25), Keith (5.5), and Byfuglien (7.6) Schultz did us a massive favor re-upping for 1.4. I could only hope that GMJR can sign Schultz for a reasonable time-frame 3 years around 5m. I would also have to assume that Conor Sheary will continue to produce at a level similar to what he has been now on a line with Crosby. Sheary is having a spectacular surplus of good luck (<-- I wrote about it) playing with Sid, however, he is an RFA and that gives the Penguins a nice leverage point to keep him in a fair contract. In most of these cases you, again, go with a short term for fair money with the opportunity of becoming a UFA later or accumulating a better case for arbitration later on. I would hope for a 2-year deal worth 3m. Matt Cullen will probably retire after this year, especially if the Penguins win another Cup. I would hope that they will offer him a job in player development after doing such a phenomenal job with Rust, Kuhnhackl, Wilson, and Sheary. That leaves Nick Bonino, Trevor Daley, and Chris Kunitz. Kunitz is a three-time Cup champion and has been an invaluable part of this team for years now but at the eclipse of 37, I don't see the Penguins paying him any more than 1m for a year if offering him a new deal at all. Traditionally, the Penguins have made a respectful offer towards their aging veterans (ex: Dupuis, Adams) but it won't be much. If Kunitz can bamboozle a team into giving him a longer term at more money (I'm looking at you Hextall) then more respect to him and I'll clap through teary eyes at his return game. Trevor Daley was another essential piece to the Penguins third Cup victory. However, he has regressed substantially this year. Last season, I think we could have traded Scuderi for John Scott and the collective fan-base would have been happy. Daley will forever be known as the player we robbed from the Blackhawks for Rob "Lead Anchor" Scuderi. Daley has talent, he has a good shot, he can manage the powerplay when asked, and the players adore him but being a UFA some foolish team will give him more money that we can reasonably afford. We can only thank Daley for his time and Cup memories at that point. Nick Bonino is woven into Penguins lore as a playoff hero. We will try and explain Bonino! Bonino! Bonino! to our kids one day as they are wheeling us into a assisted living facility. I believe he is the type of guy that you keep on your roster for the playoffs specifically. Much like Briere, Williams, and Brouwer, Bonino is just one of those guys who has that extra gear for the playoffs. The chemistry that formed the HBK line is something you can't quantify or throw money at. I would be shocked if they didn't offer Bonino a fair amount of money to stay. Conversely, he could be a second-line center on another team and take more of an offensive role on a team with less depth. I'd hope to sign him to a 3-4 year deal at $2.5 that would be a modest raise on a contending team. That would be optimal for my favorite team and not for the actual player in question who will most definitely get more on the open market. Olli Maatta David Warsofsky ? This will leave a spot open for maybe someone line Warsofsky to take the open spot or if can't sign Bonino. If we cannot sign Bonino, which I don't think will hurt the forward depth this team has, gives us around $4,000,000 to shop for a middle-of-the road defenseman. Stone, Kulikov, Franson, and Hunwick are all possible targets for the Penguins. They are all second-to-third paring plugs that can bring a stability to the Penguins blue-line.